The month of May is always an exciting time in Central Indiana, and some of that excitement will be coming to Hendricks County at the end of the month. On Friday, May 27, Carb Night Classic...The Race Before the 500 returns to the oval at Lucas Oil Raceway in Brownsburg. This event provides a great night of racing that is fun for seasoned race fans and newcomers alike. If you&apos;ve never been to a race before, the Race Before the 500 is a perfect introduction. The evening kicks off with the Freedom 75 USF2000 race at 6:10 p.m. Following that race will be the Freedom 90 Pro Mazda race at 7:10. This night of racing ends with the always exciting USAC Silver Crown Carb Night Classic at 8:15. 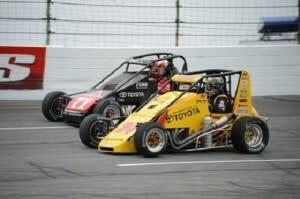 USAC Race Before the 500 defending champ Tanner Swanson will return to Lucas Oil Raceway to defend his title. He&apos;s won four out of the last five USAC events at the Raceway; will he be able to score another win? Among the field of capable challengers is Silver Crown Series points leader Justin Grant, and Tanner&apos;s own brother Kody Swanson. Whatever the outcome, you&apos;re guaranteed excitement in all three of these races. I love visiting Lucas Oil Raceway for oval track races because of the great view and high energy in every race. Every seat is a great seat, and the race is fun for fans of all ages. Be sure to bring ear protection, especially for children. My little boys love attending races at Lucas Oil and are excited to return this year! Tickets for Carb Night Classic...The Race Before the 500 are $25 for adults and $10 for children 11 and under. Tickets can be purchased at the box office, and more ticket information can be found online. Don&apos;t miss this opportunity to experience the excitement of May in Indiana!